Danang, 08 October 2017 – Canon PhotoMarathon 2017 officially kicked off in Danang this morning. About 1,200 photographers will pit their skills against each other in the premier photo contest in Vietnam. This is the 12th year of the annual photo competition, and it is already reporting record numbers of the participants and prizes at its three venues. Canon’ Danang PhotoMarathon is the first chapter of Vietnam’s flagship photo marathon in 2017. It will continue on its national journey with an event on 29 October in Ho Chi Minh City before moving to Hanoi a week later for its 2017 finale. 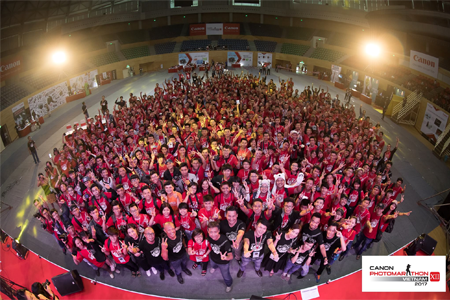 Kicking off with a ceremony early in the morning, the first assignment of the day was announced, and 1,200 red-shirted contestants commenced their Danang-wide marathon to capture the art in the lives around them. This is one of the main goals of the contest – to find the photographic beauty in the daily lives of us all, and to find the meaning in every moment. 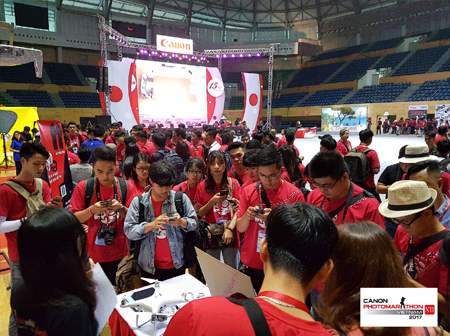 Speaking shortly before the event kicked off, Canon Marketing Vietnam Chief Executive Officer Mr. Hiroshi Yokota said: "2017 is Canon's 15th anniversary here in Vietnam, and our 80th anniversary as a company around the world. Danang is the first of our three events this year and it's always a thrill to be here standing before so many excited young photographers, eager to take to the streets and the beaches of Danang." Behind the scenes, participants had the chance to share in the wealth of street and portraiture experience of judges Hai Thanh and Hai Dong, who were happy to share some pointers with contestants. This sharing of experience proved a powerful motivator for participants in the pressure-packed day. Along to relieve some of that pressure were young and famous stars sharing their music with the gathered crowds. Prizes for the most humorous photo and a special prize for photos taken by Canon EOS M series promise to bring extra fun as well as showcase the power of the Canon mirrorless camera series. All funds contributed to the competition will be donated to the fund to build schools for disadvantaged students. It makes photography a channel to fulfill the community social responsibilities. With a total prize-pool of VND 1.4 billion, 2017 is the largest PhotoMarathon the company has ever undertaken in the country, and winners further have the opportunity to represent Vietnam in the Canon PhotoMarathon Asia Championship, where they will enter into photographic-battle with representatives of 16 other teams from all around the region. Results from the Canon PhotoMarathon in Da Nang will be published at the end of today, 08 October 2017. After the competition in Danang, Canon PhotoMarathon will continue in HCMC and Hanoi at the end of October and November. Registrations are still open for HCMC and Hanoi at www.canon.com.vn/PhotoMarathon.